I just love that word - mulch. What do you all use as a mulch in your garden? I don't usually do anything special, so the Peat Moss in my mix forms a hard crust when you water or it rains. So, what's a good alternative? Do you use straw, bark, grass clippings, leaves? What do you like to use? I'd like to use something that's not too expensive and relatively easy to find or acquire. During the fall we allow a few acres to become over grown, come sring we rake up all the dead grasses and use that. I put leaf mulch on my garden plot last fall and it has done wonders for the soil. So glad I tried it because now I can plant my spring seeds in beautiful rich earth. We are planning on using leaf mulch. Last year we bought a small raspberry & blueberry bush, and the leaf mulch seemed to work out pretty well. Have you ever used chicken manure? Hmmm. Well maybe I'll try to get my hands on some leaf mulch. I haven't tried chicken manure. I do have a compost mix that has chicken manure in it. The best mulch is whatever you have available. Can you get a bagger for that pushmower of yours? Grass clippings work well, as do leaves, as well as straw. I put leaves and straw and twigs (in general, what's lying around) through the chipper and use it. I am a huge fan of mulch. It saves a ton of work. Peat tends to dry things out, plus it's not sustainable, plus I have to buy it, so I don't use the stuff. I have been known to help myself to others' bags of leaves, though! 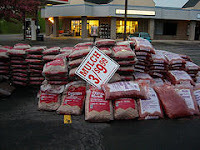 We mulch with free chips from tree companies, gumballs, leaves, twigs, sticks, cardboard, shredded paper, grass clippings, pine needles, coffee grounds, etc. For people in apartments/condos/townhouses who might not have yards (and thus access to organic sources of mulch), a mulch made out of recycled tires might be a nice alternative. I've been using it for my "garden"- potted plants (just some tomatoes and flowers this year)- and it does an excellent job of locking in the moisture. Also, because it is recycled rubber it lasts for years supposedly and doesn't need to be replaced/disposed of like organic products (which again would be difficult without a yard). Also, my parents have pine trees in their yard and swear that pine needles and banana peels placed in their rose beds are the reason their plants/flowers are so gorgeous. I use Garden Grounds from Starbucks. You can go into any local starbucks and ask for their graden grounds, if they look at you stupid, because some of them do, ask for their used coffee grounds. It smells wonderful and it looks amazing in your garden. I live in Texas and most of our plants can thrive off the high acidity found in the coffee grounds, make sure your planst can. 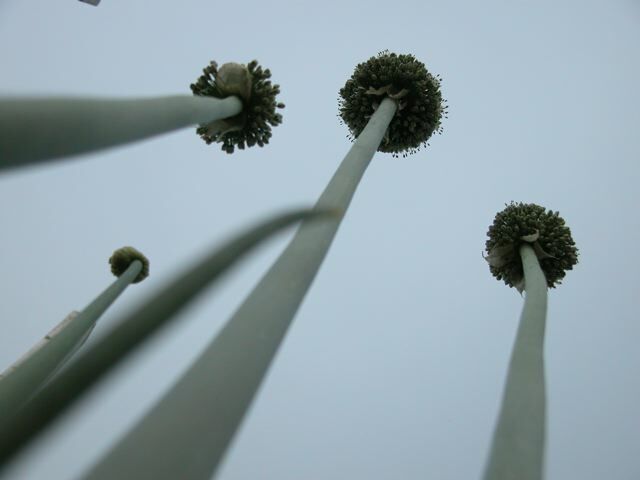 One cool thing about the Graden grounds, plants like orchids, the flowers will change color due to the acidity. It is a great mulch and it is free. You may have to make many runs to starbucks to get enough for you rgarden, i just stop in as I go by.